My husband and I have started to transform what used to be our guest bedroom into the nursery. 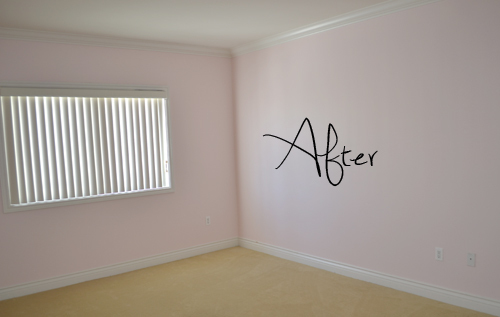 The first thing I wanted to do was paint the boring beige walls the perfect shade of pale pink. One thing I didn't know, was just how many shades of pale pink pink there are to choose from! Talk about overwhelming! We ultimately decided on "Pink Cloud" by Benjamin Moore and I couldn't be happier with the final result. While this is only the very beginning of the room transformation (I still want to change that ugly light fixture), I can't wait to share more photos of our progress along the way! it looks so pretty! such a perfect shade of pink! Perfect shade of pink, so beautiful and calming :) Excited to see the final result when you put in the interior! looks so adorable! love that color! Beautiful, perfect shade of pink! This is such a perfect shade of pink! Adore! What a beautiful color! I think you made the right decision! Thats such a pretty shade of pink! Love it! 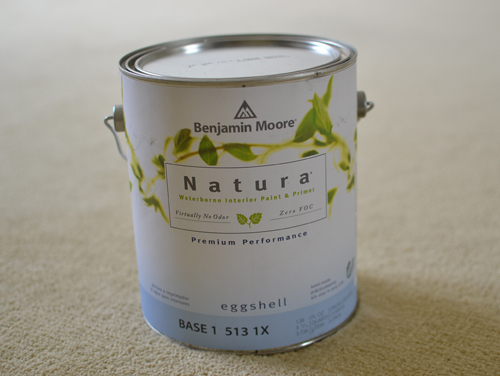 What a lovely color-so soothing for a baby's room! Can't wait to see what else you do! Aw, so exciting isn't it??! Cannot WAIT to see more! I would suggest removable wall decals to decorate the room once it's furnished. That is just going to be gorgeous, dear...that soft pink is soooooooo gentle and elegant! And will be impeccably decorated, I'm sure. Love that soft pink color :) Can't wait to see how it all turns out in the end. I bet you're having a blast picking out baby stuff for the room - I know I would be! LOVE the color you chose! Can't wait to see how this blank canvas of a room transforms :) I might have to get some ideas from you! Oh wow...I'm so happy & excited for you Audrey! Pink walls mean it's a GIRL?? wonderful Audrey ! can wait to see you with your little one ! It's so soft and pretty, I love it! You are going to have so much fun decorating! That color is beautiful! This is so cute! WOW! awesome job! i love this shade of pale pink!! I love the after version.